Custom Solutions :: Plasmatechnology Inc.
PLASMAtech recognizes that no two production PECVD or plasma processing requirements are identical. So before recommending an equipment solution we get a complete understanding of your current and anticipated production logistics. Then, utilizing state-of-the-art process technology and proven design concepts, we work with you to customize a solution to efficiently integrate surface engineering equipment into your manufacturing environment. Many features can be customized including special liquid flow controllers and vaporizers, PLC touch screen control with paperless process parameter and trend reporting, dual-frequency plasma generation, various chamber sizes/configuration, process gas distribution, and parts fixturing. Material handling can range from simple manual transfer tables to totally automated hands-free processing. 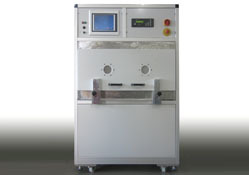 Do your processing needs include wet pre-cleaning prior to plasma treatment? 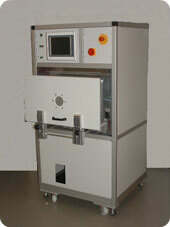 Do you require both low pressure plasma and parylene equipment? Contact PLASMAtech to discuss our solutions for high volume, multi-process systems.